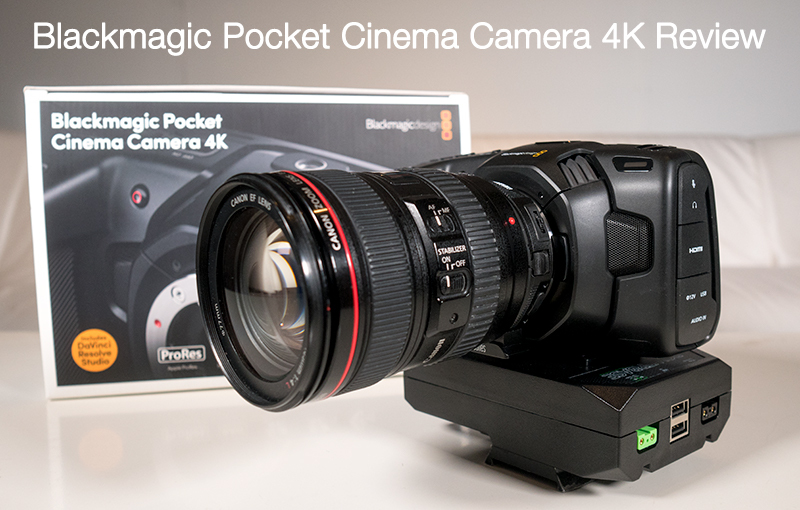 At around £1100 or $1400 USD and spec list that seemingly exceeds its competition in the same price range we took a gamble on the Blackmagic Pocket Cinema Camera 4K. 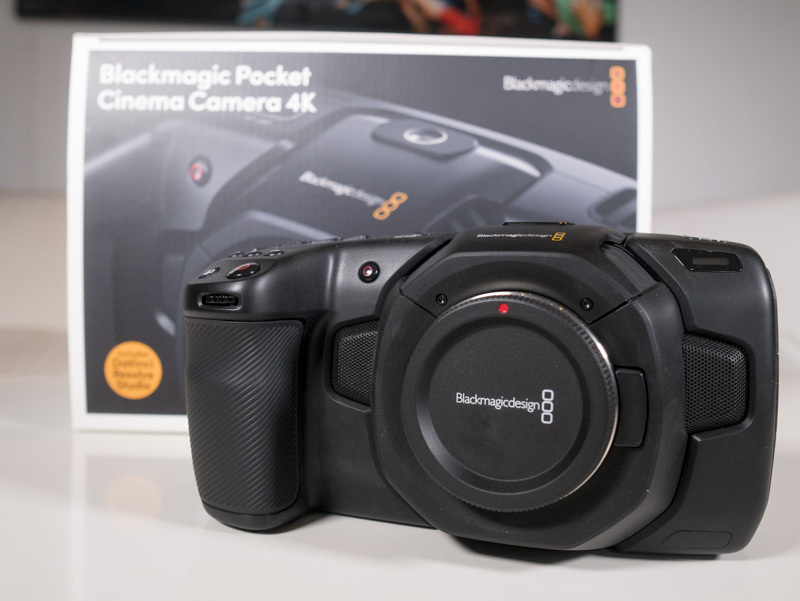 The Blackmagic Pocket Cinema Camera 4K Review – what’s all the fuss about? Why the camera appealed to us? In what ways does the camera live up, exceed or fail to meet our expectations? What appeals to us about this camera might not appeal to you and vice-versa, so here’s a disclaimer straightaway: this review will not be a detailed technical breakdown of the camera – there is plenty of that already online – but it will be a review of features that we use on a daily basis for our video production company, mainly the video quality, the audio quality, reliability and overall satisfaction with using the camera. Why go for the BMPCC 4K? Let’s face it what the Blackmagic Pocket Cinema Camera 4K offers in its spec sheet isn’t actually anything groundbreaking, but it could be argued that from its price point it is exactly that. 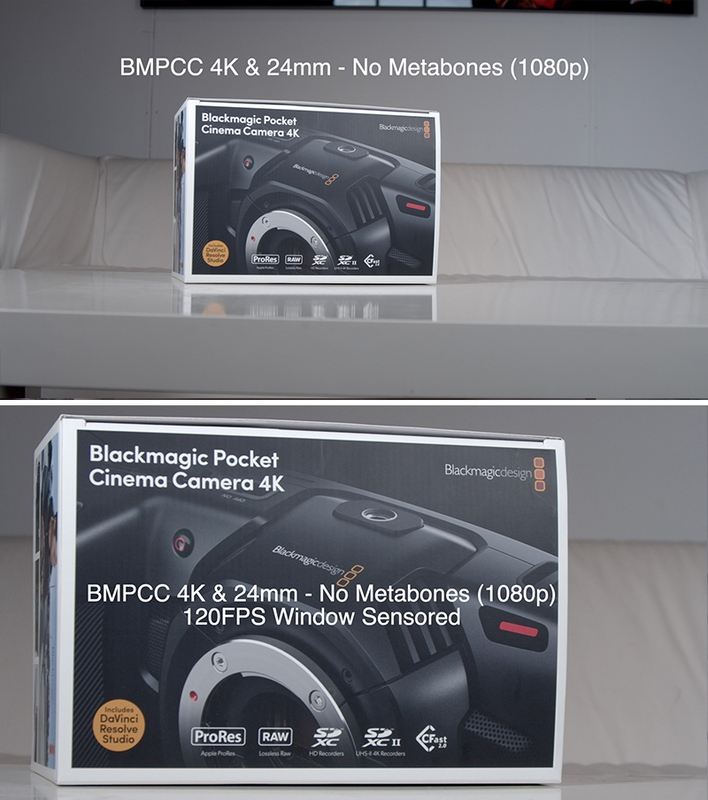 You’ll find other cameras out there that have similar feature list, but if you purely look at what you can get for the same price that’s what makes the Blackmagic Pocket Cinema Camera 4K (BMPCC 4K) really stand out. For example, our main camera is the Canon C200 which has more or less the same features as above (minus the ProRes and Davinci Resolve) but costs around five times more (£6500/$8000). 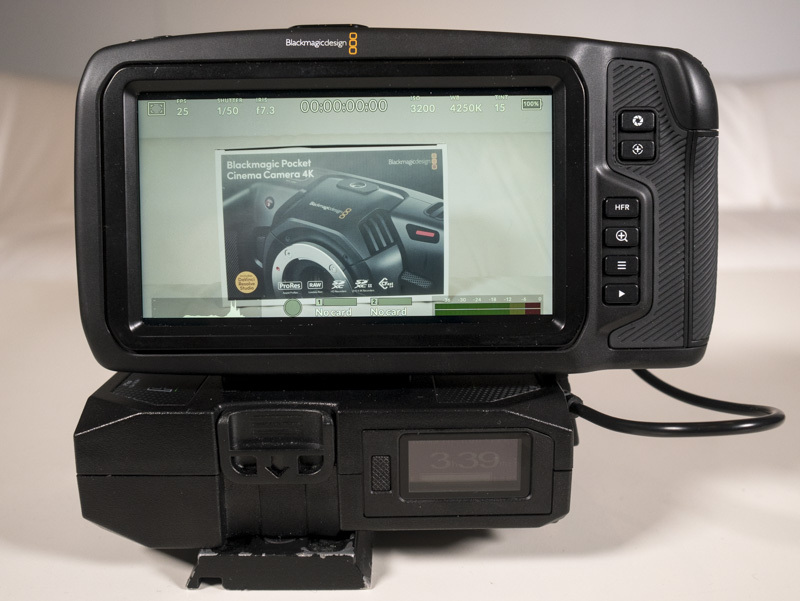 The two cameras are of course completely different and a comparison isn’t the purpose of this review, however, what really piqued our interest in the Blackmagic Pocket 4K was when it came time to retire what had been our trusted b-cam for many years, the fantastic workhorse the Canon C100. Will the BMPCC 4K be a suitable replacement for our Canon EOS C100? The BMPCC 4K – a gamble or the perfect b-cam? With the C100 retiring from our midst (RIP) we decided to gamble upon the BMPCC as it’s replacement. We saw it as a gamble as a) we’d never really used Blackmagic cameras before and had heard mixed results (mainly great image but poor reliability/usability) and b) even though it would be primarily used as a b-camera on jobs, occasionally it would need to step up and be an A cam if we had two jobs on the same day for example. So it would need to be reliable, have a great image and have great audio. Having not properly used Blackmagic cameras before then this felt like a gamble. And a lot to ask for arguably a budget price video camera. But we did ask a lot no matter what. We knew the camera would have limitations – it would just have to for the price – but we hoped for the best as we really, really wanted to like the camera as it would be a great budget conscious camera for us if it lived up to our expectations. And did it live up to them? 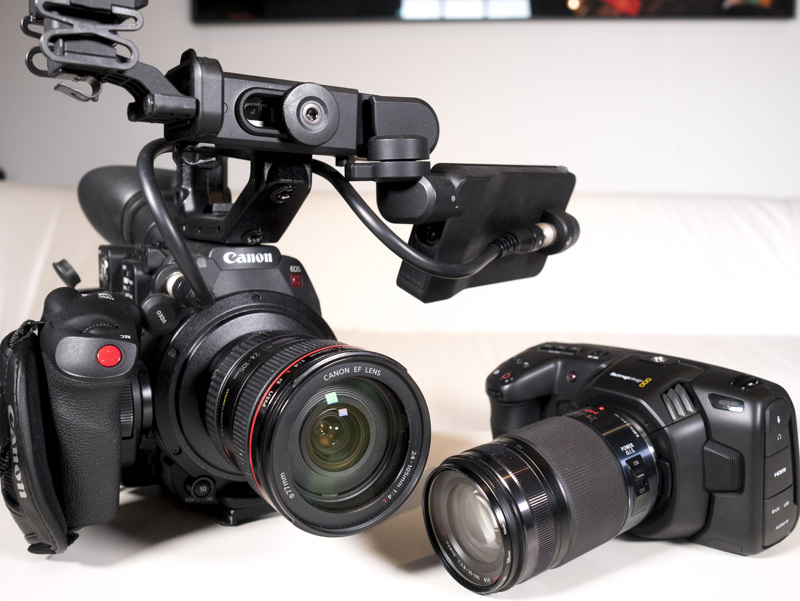 Can the Canon C200 and the BMPCC 4K become bestest buddies? Since we purchased the Blackmagic Pocket Cinema Camera 4K (BMPCC 4K) we’ve used it on a variety of jobs including sit-down interviews, b-roll in science laboratories, Christmas markets in Copenhagen and a music video in Manchester, and below are some of our first thoughts about the camera. Below is the first test we did with the camera, while we were in Copenhagen for a shoot we took the BMPCC 4K out for a quick test in the evening at the Tivoli Gardens. High contrast lighting at nighttime was a challenge but it was a good test to see how the camera would cope and how it would feel in the hands while operating, as all was done handheld. The most noticeable aspect of the camera on first use is that, thankfully, the image is sharp and detailed. The video below was a sit down interview using the BMPCC4k as the B camera, focussing mainly on capturing a tighter shot than the A camera, and the audio was captured using the internal mics only (more on that later). The video clip(1920x1080) above was shot with the Panasonic 35-100mm 2.8 lens and we were really happy with the results obtained with this combination. Also a bonus was the fact that the image stabilisation worked really well with this combination. although it obviously isn’t needed in the above shot, we did test the camera handheld just to see how it responded and the difference between having IS on or off was huge. For a small package the BMPCC4K and a native-fit lens with IS seems a good option for people looking for something small and light to use for candid projects if needed. However, as we already had a complete filming set of EF fit lenses we wanted to avoid having to buy a whole new set of lenses just for the Blackmagic Pocket Cinema Camera 4K, so after some deliberation we also purchased the Metabones EF fit speed booster to be able to use our current range of EF fit lenses. The metabones rapidly became our best friend when using the BMPCC 4K, essential buy! 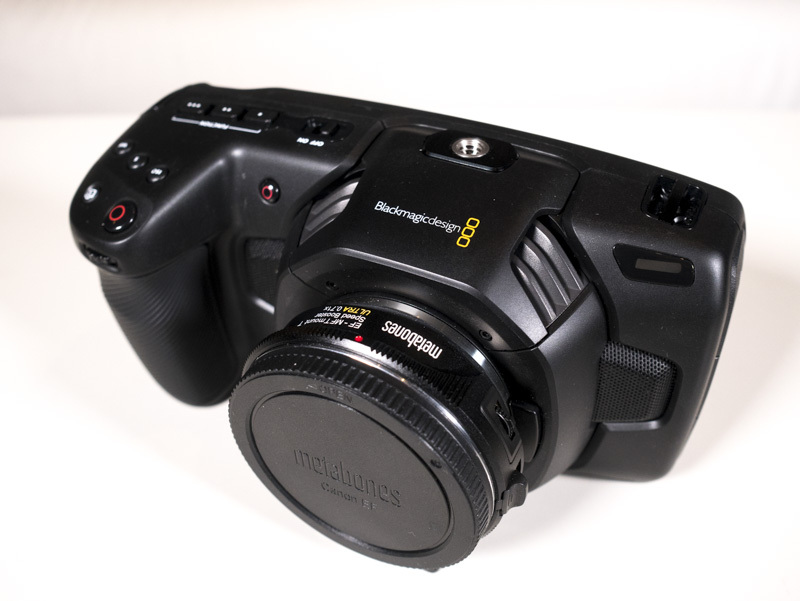 The Metabones speed booster isn’t cheap at around $650, but what it offers is not only the chance to use EF fit lenses on the camera, but also effectively make the Micro Four Thirds sensor of the Blackmagic camera into Super 35mm sensor by widening the angle of view from the lenses, while at the same time making each lens a full stop faster. That’s a pretty powerful camera upgrade for around $600, and as the Blackmagic Pocket Cinema Camera 4K was always intended to be a B camera to go with the Canon C200, having both cameras effectively having the same image sensor size means matching shots and styles between cameras is much easier. The Metabones proves its value even more when using the high frame rate setting of the camera of 120fps as the camera uses an extra crop of x2, which makes wide angles 120fps shots very difficult without the extra angle of view provided by the Metabones. 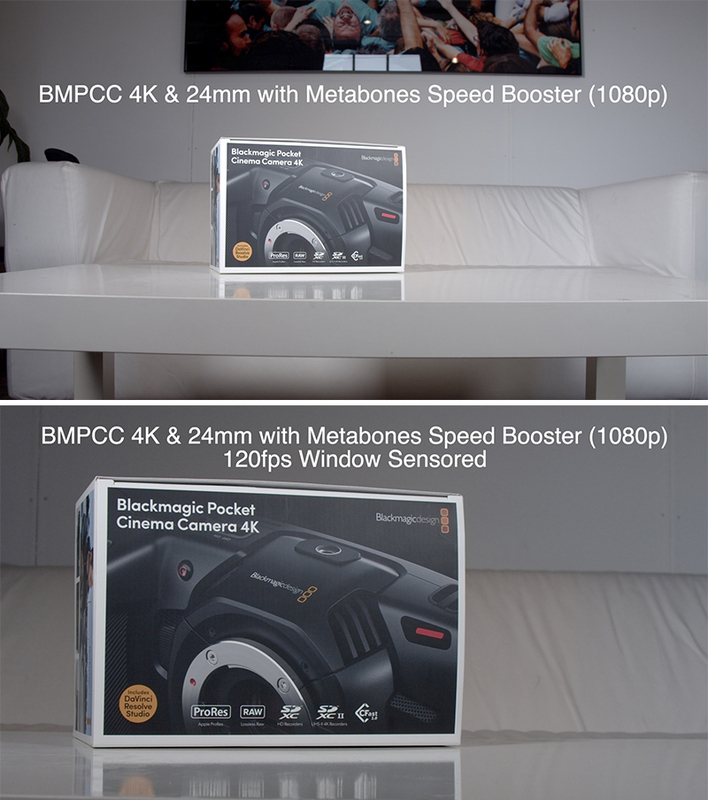 Below are some simple screenshots showing the cropping the Blackmagic Pocket 4K does in normal and high frame rate mode, both with and without a Metabones speed booster. As you can see above without the Metabones the window cropping on the 120 FPS setting is huge, making most lenses into telephoto, which may or may not suit the desired shot. However, the Metabones, although also heavily cropped, due to having a wider angle to start with makes the 120fps option much more user friendly. Sometimes a camera can be capable of the most amazing things but the operating system or physical layout of buttons can make operating the camera far more hard work than needed. Luckily we’ve found that the operating system on the Blackmagic is simple, intuitive and well laid out. I believe it’s the same menu layout as their other cameras so if you’re a fan of that, you’ll feel at home here; but even if you’re like us and newcomers to the Blackmagic ecosystem of cameras in many ways the menu system couldn’t be easier. 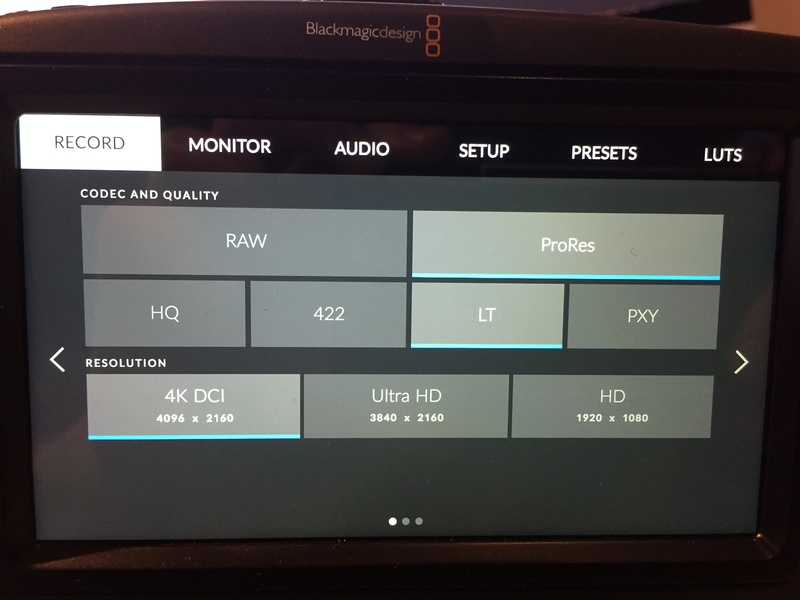 Choose the codec, quality and resolution of your footage quickly and easily with the Blackmagic Pocket Cinema 4K menu system. One of the most appealing things about the BMPCC 4K which sets it apart from its price point competitors is its mini-XLR connector, few if any sub-$1500 cameras allow you to connect a microphone via XLR and offer phantom power too. This was a big selling point for us, and although you have to buy a mini-XLR to XLR cable separately the audio quality from the preamps is nice and clean. However, not all was straightforward with the audio upon our first tests as we had mixed results with both the internal microphones and 3.5mm input. The first test with the camera came with a sit-down interview situation and using the Blackmagic Pocket 4K as the B camera. As we were in an isolated room with no noise problems and the interviewee was only around six feet from the camera we used the internal microphones, purely just to sync the camera with the C200 and the radio mic audio been used. However, we found that even with the microphone levels on full, the audio levels were really low, barely toughing -32dB when the interviewee was talking. As we were in a quiet undisturbed room this wasn’t a problem to sync still, however, if we were in a slightly noisier environment or the subject was further away/quieter then I’m not sure the sensitivity of the internal microphone would be much good, even just for scratch audio or syncing. Another issue we had was when we plugged a microphone into the 3.5mm input the audio level was very quiet again. To compare we plugged exactly the same microphone and cable into two other cameras, the Canon C200 and the Fuji X-T3. Both of these cameras had nice, clean audio coming through at a good level through their 3.5mm inputs, however the audio coming through the 3.5mm input on the Blackmagic was so low as to be no better than using the internal microphone really. So, we decided to send an email to Blackmagic to see if this was right or if our unit wasn’t working as it should. The response from Blackmagic customer support confirmed to us that the 3.5mm inputs at line level only, so plugging a microphone into this slot – even one with battery powered phantom power – would not be recommended as the levels would be very low. Using a line level microphone though, such as the Sennheiser G3 wireless or equivalent can be used with great results. We were slightly gutted with this as having a mic level 3.5mm and a phantom power mini-XLR inputs allow for multiple audio recording options. However, all was not lost as we learnt that the latest firmware update (5.2) does indeed fix this and provide the 3.5mm input to be used at both line or mic level. Considering the pretty widespread derision of the battery life of the original Blackmagic Pocket Cinema Camera it was slightly surprising to see Blackmagic stick with the Canon LP-E6 as the battery of choice, and first impressions of the battery and cameras performance together were not good. It appears that not all LP-E6 batteries are created equal, both performance wise but surprisingly physically too. Performance-wise first, we found that already owning several LP-E6 batteries from previous cameras we achieved varying performance levels and interaction with the camera, but not always as expected. We found that the battery level indicator was very unreliable. Unreliable in that a fully charged battery would show 80% when put in the camera, and then could jump to 57% and then to 0% in the space of 5 minutes. This was very worrying, but bizarrely we found that the camera sometimes would operate for a very long time on 0%, one time it even lasted 40 extra minutes while showing 0% on the battery level indicator. We found no real difference between official Canon batteries, or third-party, or more annoyingly the battery that actually came with the camera was also very unreliable in its battery level indication. even now putting the battery that comes with the camera into the camera it doesn’t show a percentage anymore, while on other batteries it will. all very unreliable. Not knowing when or if your camera will turnoff at any moment is really not acceptable for a professional camera, but worse was yet to come. Having already owning a handful of the batteries (both official Canon and third-party) and seeing that the interaction with the camera really wasn’t good with some of them – some fully charged batteries would die within ten minutes use – we thought maybe some of our batteries were old and needed replacing. So, we opted to buy two Hahnel HLX-E6N Batteries and while they are not the cheapest LP-E6 batteries around they are cheaper than the Canon, but still they received good reviews and were a known brand at least. Well, yes, as you’ve guessed the worst case scenario happened with these batteries: while testing the batteries out, when one drained fully we went to replace it only to not be able to remove the battery: it was completely stuck. Leaving the battery to cool down didn’t help and we had to move it back and forth slightly. Not ideal. After this we found that no battery fit correctly in the camera. Far from ideal. After some research online it really seems that we are not the only ones to have this problem, and not just with this particular battery; many people seem to have had the same problem with batteries getting stuck inside the camera. Not being able to confidently out any battery in the camera and the battery interaction previously being not really usable we got in touch with Blackmagic support again, who very kindly asked us to send the camera in to have a look at it. The wonderful support actually sent us a brand new replacement camera, with which we have had no problems whatsoever with batteries getting stuck. Battery indicator levels though do appear to be unreliable still. The Core Powerbase Edge can power the camera for 3.5 hours, while we found individual batteries lasted up to 45 mins. A More Reliable Battery Solution? Having been left largely disappointed with the battery compatibility with the camera we started to look around for other solutions than just returning the camera and going with another brand camera completely – yes, it was that much of a deal for us. But we did feel that if the battery problem could be solved then the image and usability of the camera would make it a great camera. And it was then that we found out about the CoreSWX external battery for the camera. Promising 3-4 hours of continuous use with a reliable battery level indicator seemed like a possible solution to our problems. Again, not a cheap option at around £270 ($350) it added another 25% onto the initial price of the camera, but even with this extra cost it still arguably beats the competition for its price. Much to our delight the CoreSWX external battery works great with the camera and allows roughly 3.5hrs per full charge of use with the camera. So having that and a handful of batteries and a AC adaptor means that we’re now finally confident when using the camera that we have the power to use the camera professionally. The Core Powerbase Edge: not the most ergonomic, but very practical. As you’ve probably gathered so far any sort of view of the Blackmagic Pocket Cinema Camera 4K is seen through the viewpoint of its price. For £1100 the BMPCC 4K is great value, providing a lovely image in an edit friendly codec of ProRes, and that’s before even mentioning its RAW capabilities, unheard of for the price range. There are, however, downsides to the camera: battery problems led us to return one unit and then to purchase a relatively expensive external battery for the unit. A cost we consider worth paying for the extra reliability when using the camera. Similarly, the Micro Four Thirds mount and sensor isn’t ideal and I’m sure many would prefer the camera to have a Super 35mm sensor, but that would undoubtably raise the cost considerably. The way to get around this is to purchase the Metabones speed booster, but for the sum of $650, coupled with the external battery you’re close to doubling the initial outlay of the camera. But even with the these extra costs, at £2000 is the camera, speed booster and battery pack a good value video production combination? We believe that the quality of image and codec options of the camera make it a great investment; 4K, RAW, XLR input, up to 120fps: the Blackmagic Pocket Cinema Camera 4K has so many filmmaking possibilities it’ll undoubtably continue to fly off the shelves (if there is ever any stock of them on shelves that is). Thank you. Your review was excellent.